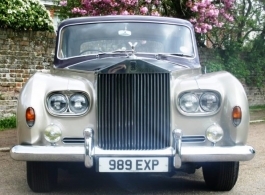 1964 Rolls Royce Phantom MKV for wedding hire in Surrey. The Phantom V is a large and exclusive four door saloon that was made by Rolls-Royce Limited from 1959 to 1968. This classic Rolls Royce wedding car is a limousine model built for Royalty and can seat up to six people comfortably. It is a beautiful Burgundy & Silversand colour which gives off a Gold tint, the Beige cloth interior is finished with a luxurious walnut trim, deep pile carpets and its own drinks cabinet. Note that 2 of the passenger seats in the rear are fold away 'occassional' seats.